Top o’ the mornin’ to ya! At Delavan Lakes Vet Clinic, we’re excited for yet another chance to become Irish for a day. It’s a time honored tradition. 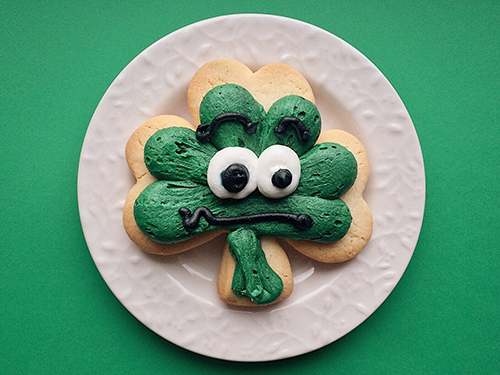 Each year, as St. Patrick’s Day rolls around, we enjoy plenty of festive food, parades, and (of course) green beer. 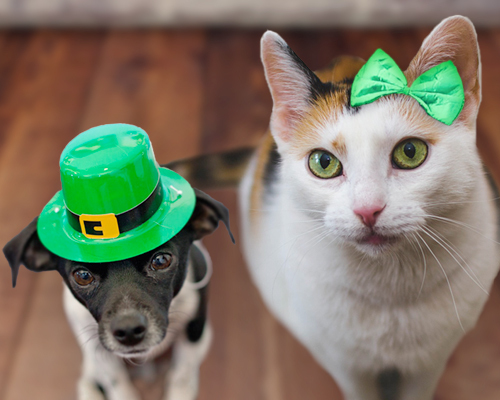 But as with other holidays, St. Patty’s also presents a number of potential hazards and toxins that can be detrimental to the health of our beloved pet companions. Of course, it’s hard to bring up St. Patty’s without mentioning green beer. It has become one of the most iconic expressions of celebration for the Irish holiday. Over time, other creative, green libations have been developed, as well. Strangely enough, some dogs and cats find the smell of beer and other forms of alcohol rather appealing and can be very opportunistic if a glass is left unattended. This is bad news because alcohol is toxic for most animals, and may result in symptoms of confusion or depression occurring within an hour’s time. Keep your furry friend protected by storing drinks above your pet’s level and out-of-reach. Be sure to keep an eye on both your beverages and your pets to ensure the two never meet – and be careful of spills. 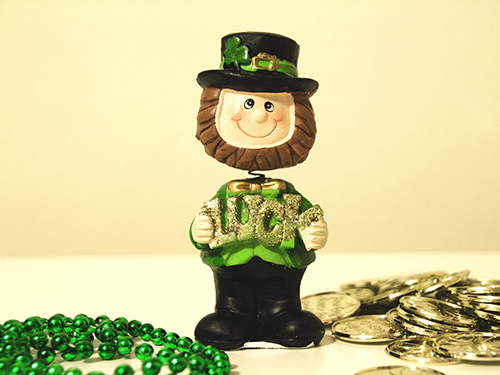 It’s not unusual to celebrate St. Patrick’s Day by handing out strings of green beads, fake gold, or other goofy decorations to help you get into the spirit of the day. Unfortunately, if these beads or other trinkets make their way to the floor where your pets can find them, these innocent objects can transform into devastating hazards. Plastic is very harmful when swallowed. In dogs and cats, it can lead to choking/vomiting, an obstructed digestive tract, dehydration, and even surgery! If you’re hosting a party, designate a safe space for your pets – away from the action – to avoid a serious issue. We’ve all heard of the lucky four-leaf clover, but did you know there are several plants that can be classified as shamrocks? The Animal Poison Control Center (APCC) receives calls each year around St. Patrick’s Day, often in response to a pet who has eaten Oxalis acetosella. A quick study of this plant species will prove it’s not so lucky for canines and felines. Immediate head shaking, upset stomach, drooling, and kidney damage can all result from your pet swallowing this hazard. Keep all clovers and shamrocks off the floor and away from where your dog or cat would easily come across them, and keep a watchful eye on your pets for signs of trouble. Parades, crowded bars, or busy parties can be great ways to take in the 17th of March. However, if you plan on bringing your canine companion, be cautious of several hazards. Make sure to keep your pet near you at all times. It’s easy for others to get swept up in the festivities and forget their animal manners. This can be very stressful for your animal. In outdoor settings, the weather can also potentially be an issue. You’ll want to keep your furry pal plenty hydrated, as well as be mindful of the temperature. If you notice your pet showing signs of anxiety, it’s time to bring them back home. Although the holiday can be very enjoyable, there are also those who don’t enjoy it responsibly. Be on the lookout for drunk drivers or unsafe behavior when you’re out on the roads. And (of course) NEVER drink and drive yourself. Corned beef, boiled cabbage, cupcakes with green frosting and sprinkles; these are all tasty staple foods of St. Patrick’s holiday. But your pet may also find these provisions appealing, even though their digestive tracts will not. Chocolate, candy, high quantities of salt, or synthetic green dyes can prove toxic to your cat or dog’s health. Upon consuming these festive foods, vomiting, diarrhea, seizures, and even more serious symptoms may occur. Just like with alcoholic beverages, be sure to keep all food out of Fido and Fluffy’s reach and clean up promptly. You may also want to avoid potential pet hazards by designating a safe area for your cat or dog to stay while the celebrations commence. Unfortunately, even if you take proper precautions – accidents can still occur. It’s always better to be safe than sorry. If you find that your animal has swallowed or shows symptoms of contact with these common pet hazards, please don’t hesitate to give DLVC a call at 262.728.8622. We wish you and your four-legged buddy a very happy, hazard-free St. Patty’s Day this year. Cheers!